When Anders is given a new job way above his pay grade, he’s grateful. Working as the only security guard overlooking a crew of a dozen miners in Antarctica for six months? Everyone assumes it’s going to be a quiet six months of kicking back and doing nothing—until the bodies start piling up, and all fingers are pointed in his direction. I can be picky about “whodunit” thrillers like this, but I absolutely adore Antarctica as a setting, so I was immediately intrigued by the synopsis. I’m a sucker for any sort of icy, snowy tundra-esque settings in spooky reads, and sometimes you just can’t beat a good murder mystery. Just a few days into the night shift and we had a death on our hands. 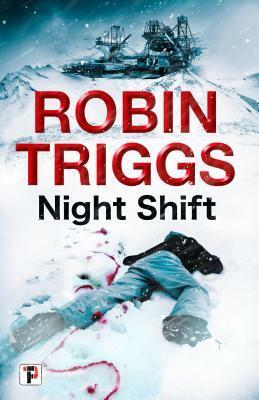 One thing that Triggs does exceptionally well is utilizing the setting here—if you enjoy thrillers set in icy settings like I do, you’ll enjoy how heavily Triggs relies on the snow, the freezing temperatures, and the total isolation to build up the dread. You can really feel how isolated these characters are, and that gives a sense of hopelessness to the entire mystery. The characters themselves are also pretty interesting. Usually, when a book has this many fairly prominent roles, the characters all begin to feel very one-dimensional and similar, but several (not all, truthfully) of the crew members are intriguing, complex beings with their own motives and stories, and that’s a nice touch. Unfortunately, neither of those benefits were able to totally outweigh the general blandness of the story, or its predictability. I pegged the killer within the first two chapters or so, and while one small element of the ending did surprise me, I still felt a very anti-climactic sort of letdown by the whole thing. Beyond that, this book just has so much unused potential! There’s a whole sci-fi element to it, yet it’s never fleshed out enough to be what I wanted. Instead, it feels very underdeveloped and as though it was only put in the story to explain the ending—without this one tiny twist in the end, honestly, the entire story could have gone without any sci-fi elements and been chalked up to a standard murder mystery in our current time period. While Night Shift has a lot of potential, it simply missed the mark on a lot of things for me. I wanted more thrills, more development in the world-building, and a better ending, but I did enjoy the immersive setting of Antarctica and the writing itself, which is fast and fun to read. If you’re someone who doesn’t read a lot of thrillers or isn’t particularly picky about them—and you don’t care much about sci-fi plots—I would definitely recommend Night Shiftto you. While I wasn’t the ideal audience for this story, I can think of plenty of people who would love it! 2019 New Release Challenge Sign-Up Time! Great review, Destiny, and I definitely felt the same about this one. Which is a shame because those sci-fi elements would have been interesting to get a deeper dive into! Thank you! Right, agreed – if it had more of the sci-fi, I definitely would have liked it more!